Soldiers assigned to the 160th Forward Surgical Team, FST, are fielding a new concept that involves breaking down their personnel into smaller elements that will still allow for surgical capabilities. Their first fielding attempt was in support of Exercise Anaconda 2016 in Chelmno, Poland. Anakonda 16 is a Polish-led, joint multinational exercise taking place throughout Poland June 7-17. 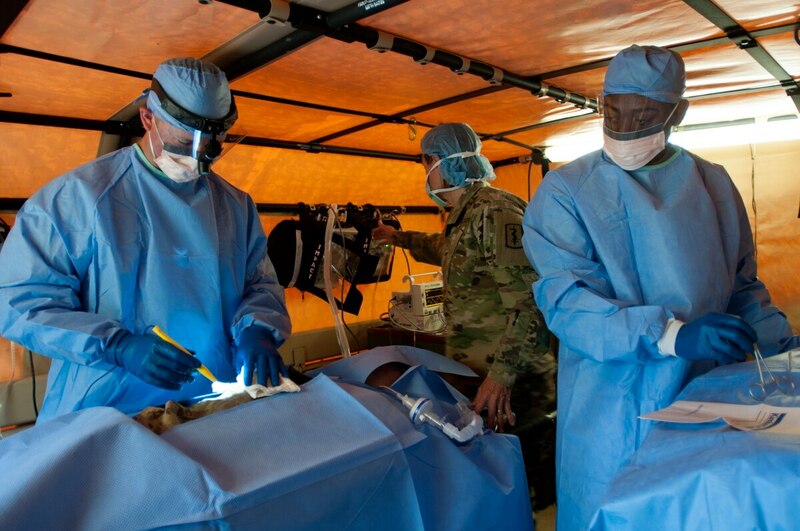 The Army Surgeon General says the service is taking necessary steps to improve its operational readiness, to include small teams of medical experts able to deploy anywhere in the world to treat U.S. soldiers and save lives. 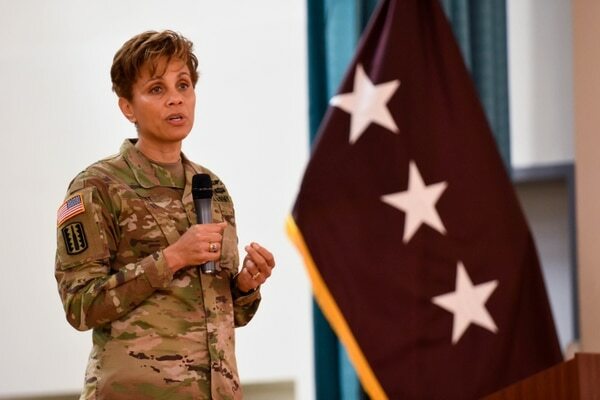 Lt. Gen. Nadja West, the Army's top medical officer since December, said her soldiers are now deploying in smaller and more agile surgical teams and serving alongside soldiers and Special Forces groups. She is also working to improve Army Medical Command's ability to deploy an entire combat support hospital should it be called for duty. Among her other goals: reducing the number of non-deployable soldiers and advancing the Performance Triad, the Army's three-pronged approach to fitness that focuses on sleep, nutrition and exercise. West, the highest-ranked female graduate of West Point, is the first black woman to obtain the rank of lieutenant general. She was the first black woman to become a major general of the Army's active component. She previously served as as the Joint Staff Surgeon, the top medical adviser to the Joint Chiefs. Lt. Gen. Nadja West, U.S. Army Surgeon General, speaks at a town hall hosted by Regional Health Command Europe in Sembach, Germany on June 22. Her family has deep Army roots, too. Her father enlisted into a segregated Army as infantry before the U.S. entered World War II, and he later served as a logistics warrant officer in a 33-year career. Several brothers and sisters also have served in the Army, and she has a child currently attending West Point. Q. Are there any new initiatives you plan or have already begun to implement? A. We're shifting focus on the operational part of our mission. When people think of the military health system, the first thing that comes to their mind are the military treatment facilities. They don't necessarily think of these forward surgical teams out in the [U.S. Africa Command] area of operations, these small units of special operations or other special mission units out there. On the Joint Staff, I had a unique opportunity to see pretty up-close the requirements of the combatant commands, areas of responsibilities of Special Operations Command, what they need to support their missions and assets: small-footprint units, some that didn't exist. A combat support hospital is huge; every time you need medical support you aren't going to bring a whole facility. You might just need a small package, some resuscitative, surgical package. You've heard of the Golden Hour rule [Editor's note: The Golden Hour Rule refers to the first hour after a traumatic incident, considered the most critical time for treatment in order to prevent death]; if you're in Africa you might be eight, nine hours from this type of care, so you need medical assets out there. So my focus is to make sure that we're agile and adaptable enough to have the right medical capabilities to be able to do that, and not say "sorry, we don't have anything to help you with that, have a nice day." A forward surgical is about a 20-member team; it still has a fairly decent-sized footprint, so they needed something smaller. We actually created an 8-member team; they have equipment where they could backpack in to do some basic resuscitative care. That's changed since we took over. We were able to train it up in less than four months. It usually takes two years from concept to development to get the equipment, but we did this pretty rapidly, because I just did not feel comfortable telling combatant commanders that we couldn't do this. I'd [also] like to make sure we've got the ability to rapidly deploy a combat support hospital. I think if we tried to do that now it would be extremely difficult, because we have not done that in a while. It's important to take care of what happens in our medical treatment facilities. But don't forget that the operational side is why we exist. Q. How has Army Medical Command dealt with a shrinking resources? A. We're still under the constraints of downsizing. We adjust assets and reapportion them to basically where the troops go. We downsized from hospitals to clinics at Fort Jackson, Fort Knox and Fort Sill, in the last six months. That's one way we manage that, by realigning to where it makes sense and doesn't have detriment to the personnel that we support. It's never without difficulties. It's an emotional event; people love their hospital. The community and leadership appreciate having their hospital. We made sure that when we closed anything there was a viable option. But keeping the department open, if we really don't have the workload to sustain it, it's not an efficient use of resources. We do it in a phased manner to make sure we don't have an impact on our folks. One downside: we've had to accelerate some of our closings. Civilians may decide to find jobs other places, so the glide path may become faster because we didn't have the staff necessary to keep it open as long as we wanted to. 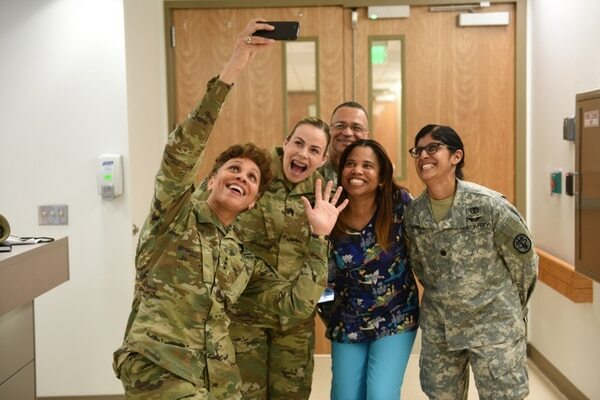 Lt. Gen. Nadja West, left, Army Surgeon General and commanding general, U.S. Army Medical Command, takes a selfie with Pediatrics staff at Womack Army Medical Center, Feb. 17, 2016. Q. What has MEDCOM'S role been regarding mitigating the spread of Zika virus? A. They've been involved with Zika for a long time, before this was even a major issue. [Walter Reed Army Institute of Research] has a long history of vector-borne illness and understanding what the concerns are. The Army was proactive in doing the vector sampling at the installations, well before it was even a requirement. There was an article that came out in Science. [Vaccine testing] started with mice, and now in the non-human primates. They found that this vaccine appears to be effective in that phase. They're very excited. It is the one that Walter Reed is working on, of course with the collaboration of some others. Q. And in terms of soldier protections? A: We put these traps around that caught mosquitoes to determine if they were carrying the virus. We're also the only service with a permethrin-impregnated (mosquito repellent fabric treatment) uniforms. That's a first-line countermeasure. We were sending information out to the MTFs and the clinics and installations: the warning signs, what to do, checking for standing water. They did vector spraying. Not only for Zika; for West Nile, dengue, for all the different diseases. Q. Your predecessor, Lt. Gen. Patricia Horoho, initiated the Performance Triad. Will that continue to be a focus? A. We definitely not only want to continue that but (expand on it). In fact, I was talking to her not too long ago and just let her know that it was really something that has taken hold and she should be proud of, something that started as a medical initiative that has now been inculcated into our Army culture. It's something that seems very simple; it's elegant in its simplicity. We're definitely taking that to the next level. We're not changing much now because we're just getting the data back from what the impact is on this. [Army Forces Command leaders] are still looking into these pilots. What are we finding? So before we do any major tweaks, I would like to make sure that we're (on the right track). (During a pilot at Joint Readiness Training Center at Fort Polk), they found that really using very strict sleep hygiene out there, the number of safety violations and issues in that unit was dramatically decreased. When you're out at these training exercises people stay up day after day, and then you run the risk of having issues.